Enjoy a quieter indoor environment while improving the ambiance of your space as well. Armstrong® ceilings are designed and manufactured to offer effective noise reduction in any indoor environment. Made of fiberglass, mineral fiber, perforated wood, and perforated metal, Armstrong ceiling systems are available in bright whites, warm hues, and bold colors to suit your needs. Armstrong is known for Inspiring Great Spaces™. The company does extensive research not only in developing sound dampening ceilings, but they also are innovators when it relates to creating products that are room enhancing. Whether you need to reduce noise in a small area or a large space, Armstrong ceiling tile offers flexible solutions for total noise control. Best of all, our team can help you select a system that meets your needs as well as your budget. Unfinished ceilings and open plans may be the look you want. However, they present problems with acoustics. Flat walls and tall ceilings create a reverberation effect that diminishes speech intelligibility and magnifies room noise. In fact, research studies have shown that students clearly hear only one out of every four spoken words in a classroom that has inadequate ceiling acoustics. Fortunately, when you depend on Couser Supply Inc., you do not have to settle for a subpar ceiling system. 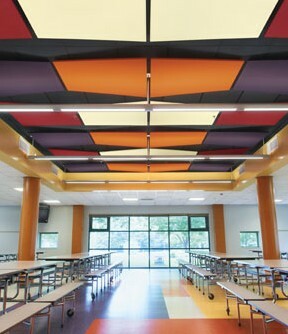 Armstrong ceiling tile systems are durable, dependable, and innovative. They not only provide the noise reduction you need, but they also improve the appeal of your rooms because they come in many different styles. Noise is not only disturbing in a work environment, but it also impedes concentration and learning. Total Acoustics™ ceiling panels offer the perfect combination of sound absorption (NRC) and sound blocking (CAC). This gives our customers both noise control and design flexibility for their spaces. These Armstrong ceiling systems come in different ratings from good to better to best. Depending on your needs, we'll help you choose a ceiling that works best in your space. Improve the acoustics in your home or business with Armstrong ceilings. Instead of installing a drywall ceiling, why not make yours perform and look even better. Create a room that is appealing and sound absorbing by depending on us for Armstrong ceiling systems. The leaders in stylish yet functional ceilings, the company designs products that are attractive, eco-friendly, and highly effective at dampening sounds in a wide variety of environments. Contact us for more information about our Armstrong ceiling systems. We proudly serve clients throughout the United States.